1968 are a band hailing from Cheshire, England. They formed in 2013 and they play a style of massive and compelling Stoner Metal. Having released their debut EP in January 2016, the band went on to record their next offering, an EP titled "Fortuna Havana" that was released in February 2017 via BLACK BOW RECORDS. The band generates just the amount of fuzz that is rewarding and a bit shy of a garbled sound. They don't need any more than that because their musicianship is doing all the rest. Their attitude is very appealing – their performance is powerful and compelling, which is highly characteristic of the Stoner revival wave of recent years. 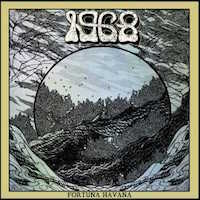 This genre seems to offer many excellent bands, and 1968 is no different in this respect. It would be a bit odd to say, but they do sound slightly flashy compared to the "loose" or "sloppy" image of this genre, and still manage to retain their integrity in a way that would please fans of dirtier sound. The overall production is perfectly balanced and the tightness of the band's performance indicates the recording sound well-rehearsed. To me, Jimi Ray's vocal delivery is reminiscent of GRAND MAGUS' Janne Christoffersson – powerful, convincing but slightly grittier than the latter. This guy has pipes! "Vorpal" sets the bar high right at the beginning. The opening lead transforms into a winding riff that pervades the entire space and fills every void. Also, the buildup of tension is immense and doesn't let go until the final note. The songwriting is very fluid and rhythm section is doing a tremendous work of mobilizing this machine. Tom Drury's passionate drumming cannot be ignored – the drums' presence is well felt and the excellent sound makes it possible to appreciate the skillful performance. The best thing about this album is that each instrument is given an opportunity to shine, and neither of them overshadows the other. "War Dogs" had that hypnotizing, mantra-like riff that adds a psychedelic touch to the whole experience, and the occasional change of pace keeps things interesting. "Havana" is an intense song that opens in a grand fashion with a droning chord, and then the drums and guitar riff kick in. When I first listened to this song, I realized that I was immersed in it that I actually forgot to breathe (which is also a way of inducing psychic phenomena without substance abuse). So far, everything was good. Even excellent. But there is still one complaint – this album is too damn short! True, every song in here is a gem but an album twice as long could really make my day. I haven't been familiar with 1968 until now, but now I mark them as one of the biggest promises of recent years, surely in the Stoner scene. I hope they are working on their debut LP right now. I'll be waiting patiently but anxiously. If you're into fuzzy riffs, don't look any further – buy this beast of an EP. You won't regret it!